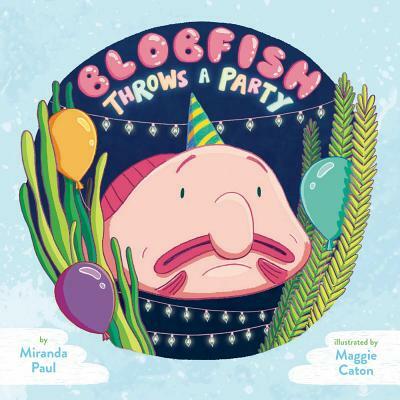 Introducing Blobfish Throws a Party, a wild and hilarious story from award-winning author Miranda Paul! Blobfish lives at the bottom of the ocean with no lights, no friends, and no delicious treats. The only two ways he can think to change this would be to 1) throw a party, or 2) save the world in true hero style. He decides to do the first one. However, when he announces, "Deep sea party! Bring a treat to share! ", the mermaids hear "Cheap, free party! Sling on a sheet to wear! ", and the shorebirds hear "Cheep-peep party! Sing a tweet with flair! ", and so on. Soon the whole world is partying in strange ways based on what they think they heard, and Blobfish is still sad and alone at the bottom of the sea. Will Blobfish ever get his lights, friends, and delicious treats? Miranda Paul, award-winning children's author of Water Is Water (a School Library Journal Best Book of 2015) and Trainbots (Summer 2016), has worked as a freelance writer, teacher, volunteer zookeeper, and more. She began writing in elementary school, thanks to her wonderful teachers. She also enjoys science, trivia, and board games. Most of Miranda's heroes are ordinary people who do extraordinary things-including her own kids who invent all kinds of gadgets with their super-handy dad. When she's not traveling, you can find Miranda chugging around in Green Bay, Wisconsin, or online at mirandapaul.com. Maggie Caton used to live in a big house in a small town. Now she lives in a tiny apartment in a big city! Maggie is a Pratt Institute alumna and resides in Brooklyn, New York, where she does all her illustrating and exploring. Visit Maggie at mcaton.com.